A while ago, I visited New England, staying with friends where the air is clear. It was hot and a bit humid during the day, but it would settle into cool temperatures by 1 AM, which is clearly a huge benefit of living up north, in the hills. It was one of those long weekend holidays, with somwhat stressy driving on either side of solid days of beautiful weather and really good seafood. There was time for sketching, late night reading (my friends have an enviable library of mysteries of the “cosy” sort), and drowsy attempts to identify which frogs I heard through the open windows. There were trips to parks, where I sketched in the shade. I goggled at the giant frogs of Willimantic (on the bridge… very large, with shiny gold eyes). Go to this article to read more about it: Bridge Ornaments. A friend and I visited a museum up there, that was housed in a section of the old American Thread Company (ATCO). I’ll possibly post pictures from that part of the trip in my Flickr (in the sidebar). I regret nothing… not even coasting home at 2 AM to cats who had lost all hope that even the house sitter would return. [They were thrilled by their people arriving at a weird hour, and then they gave me the stink eye for the next 2 days.] I do regret leaving the cool weather and coming back, but I did have work to do and cats to feed. 6 days ago, on our evening walk, we saw lightning bugs. The other night I saw a bat out of the corner of my eye. Sitting on gnarled rhododendron branches that stretched over the edge of the lake at Girl Scout camp. Or lazing in a hammock on the wrap around porch at my great aunt’s house, reading an Agatha Christie novel. Walking to get popsicles with my father near the lake. Fish boils at family reunions. (And now because of my search, I’ve started watching a very gentle public tv show about Northern Door County… yes, it shows fall weather, but beautiful shots of the lake). So, anyone else have summer vacation memory triggers? We walked over to see a movie at the corner theatre (Ghostbusters), ate pizza out with friends, then talked with them about the summer while eating plum cake (that I made last night). The weather outside was foul — humid, steamy, and filled with ragweed pollen. Much better to have a little neighborly kaffeeklatsch in the living room to discuss trips we’ve had, or vacations others are planning. Oh, and Ghostbusters was a total blast, and held up surprisingly well although kids today would never believe a musician could live in a penthouse in NYC. So, anyone catch any good movies at the end of the summer season? I’ll probably go back to see Helen Mirren’s latest, but if there’s a film from the UK coming my way that I shouldn’t miss, please let me know so I can watch for it. Hope everyone had a good labor day, and spent a few moments at least remembering why we have this holiday and remember: look for the union label (am I showing my age maybe?). Our vacation was lovely. I’ll probably have more pictures up eventually. Hung out with friends, and watched their children play in the sand. Fought the waves (well, more the Gardener than me). Eaten more than our fair share of popcorn. And bummed around a town 20 minutes away from the seashore. If you ever want a lovely vacation, spending the time with friends, it’s great to rent 2 houses on the shore. We had massive cook offs for over 15 people at a time. Our friends are good cooks, and we sorted out kitchen duty before we drove south. * By the end of one vigil, we were well-educated, and now we will never, ever use white lights to look at baby sea turtles, because they get distracted and won’t go to the ocean or down their little turtle walkway (created in this case by humans to funnel baby loggerheads down to the ocean). Wait — you don’t believe me about the walkway? It’s a bit difficult to see in the sand [in the picture on the right], but there are two regular walls of sand on either side of a nice, easy path to the shoreline. Right by the red cooler (for scooping up turtles that need help), there is a line of stones stuck in the sand, marking where the nest is buried. 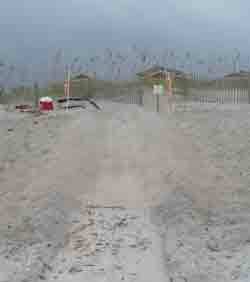 There is also a slight barricade to keep people from walking directly onto the dunes where the turtle eggs are hidden. More about the art scene in Raleigh, NC later. 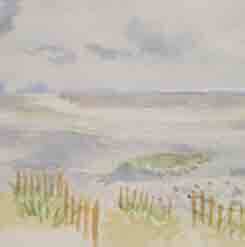 There was time to play with my watercolors while staring at the North Carolina coastline. And time to gawk at other peoples’ work. More later. I spent 3 days solid, without real computer access, ignoring the television. And, in the mornings I hiked in the desert, then knit in the shade in my own private window porch, complete with a small table, chair, and bench. 3 lucky days spent in Arizona (Wild Horse Pass Resort — really nice). I tagged along and got a real vacation. After lunch there was the option of swimming in an 85°F pool, while gazing out at the mountains in the distance (If my math is right, I think that’s 28°C), going to a spa, or retreating to the library to read about local history when it was too hot outdoors. What lovely options to choose from, when the weather I left at home was 32°F/0°C, with sleet.